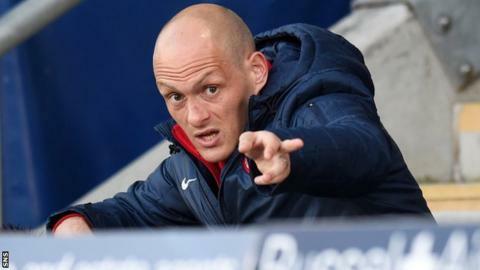 Hamilton boss Alex Neil thinks that whoever wins their tied Premiership play-off semi-final with Falkirk will have an advantage over Hibernian. Accies host Falkirk in the second leg on Sunday, with the two Scottish Championship teams vying to face the top flight's second-bottom side. "The momentum is going to be with the Championship team because both teams have been in good form," said Neil. "Meanwhile, Hibs haven't been in good form." Hibs slipped from seventh to 11th in the Premiership after a run of 13 games without a victory, with eight defeats in their last nine outings. Falkirk, who finished third in the Championship, have won seven of their last 10 games, while runners-up Accies have only lost one of their last 14 after the sides drew 1-1 in Tuesday's first leg. Player-boss Neil, who sat out the match at Falkirk through suspension, thinks the eventual winner has a good chance of defeating Terry Butcher's side in the two-leg final that follows. "I went and took in the Hibs game when they played Kilmarnock and they are low in confidence at the moment," he told BBC Scotland. "They are not winning a lot of games. "Us and Falkirk have had a great season, both teams, so there's no reason why both teams can't both do themselves proud and have an opportunity of winning." However, Neil stressed that he was not blind to the greater experience of Hibs' squad. "They're full of Premier League players with experience at that level and, with us and Falkirk being young teams, sometimes experience can tell," he said. With Rangers promoted from League One and Hearts relegated, the Championship is being billed by some as the league to watch next season. However, Neil said that a return to the top flight was vital for Accies. "The Championship will be exciting next year," he said. "But, if I've got my preference, I would rather be in the Premiership. "That's what we've been working towards all season. "We didn't really set out to win the league, to be honest, we just set out to get into the play-offs and we've managed to do that. "But our next step now is to try to see a way through the play-offs and see where it takes us." Neil stressed that, for now, his focus was on the second leg against the Bairns. "Over the piece, I thought we deserved to win the game," he said. "I thought we created the better chances and, performance-wise, I thought we were excellent. "We went to Falkirk to win the game and we will approach Sunday the same way. "It is a cup final now and the two teams know what's at stake." Falkirk manager Gary Holt was just pleased that his side were still in the tie considering they had to play extra-time against Queen of the South in the quarter-final while Hamilton were rested. "We have stood up to the test, especially after Tuesday then Saturday, but we've got a rest now," he said. "We wanted it to be a one-off tie and we've got that now, so we've got nothing to fear and we go again on Sunday."